LONDON--(BUSINESS WIRE)--The global biologics manufacturing market 2018-2022 is expected to post a CAGR of more than 9% during the forecast period, according to the latest market research report by Technavio. A key factor driving the growth of the market is the introduction of new biologic drugs for treating diseases. The demand for biologics for the more effective treatment of diseases is growing as synthetic drugs have several limitations. Therefore, the development of new biologics for the treatment of existing disorders and rare conditions is expected to fuel the growth of the biologics manufacturing industry during the forecast period. This market research report on the global biologics manufacturing market 2018-2022 also provides an analysis of the most important trends expected to impact the market outlook during the forecast period. Technavio classifies an emerging trend as a major factor that has the potential to significantly impact the market and contribute to its growth or decline. The significant growth of the biologics industry and biotech companies in the past few years has encouraged several major traditional biopharma companies to collaborate with the biotechnology startups to develop novel biologic drugs. Traditional biopharma companies are collaborating, investing, licensing the technology, as well as acquiring startup companies to leverage their expertise for faster drug development. “Several medical companies are working on advanced drug development for medical care that can possibly change the market landscape of the biologics industry in the coming years. Plenty of biotech companies are in the early to late stage of clinical testing and are expected to bring low-cost drugs to the market during the forecast period, which can considerably impact the business process of large pharma companies. Hence, traditional biopharma companies are investing in building partnerships with such startups during the early phase of drug development,” says a senior analyst at Technavio for research on infectious and rare diseases. This market research report segments the global biologics manufacturing process market by product (biologics and biosimilars), by technology (in-house and outsourced) and geographical regions (APAC, EMEA, and the Americas). The Americas led the market in 2017 with a market share of more than 52%, followed by APAC and EMEA respectively. Although APAC held the smallest share of the market, it is expected to witness the maximum increase in its market share over the forecast period. 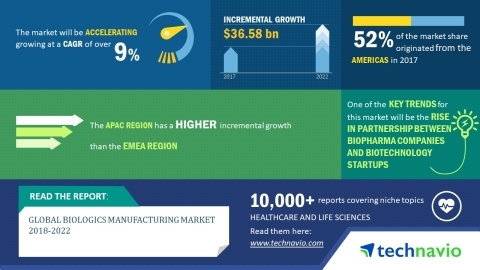 The global biologics manufacturing market 2018-2022 is expected to post a CAGR of more than 9% during the forecast period, according to Technavio.